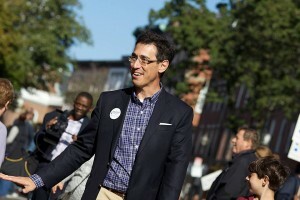 Independent gubernatorial candidate Evan Falchuk will be on the Nov. 4 gubernatorial ballot, representing the United Independent Party, which he launched in January 2013. This is the first part in a five-part series of profiles about the gubernatorial candidates facing off in the Nov. 4 election. Attorney and entrepreneur Evan Falchuk is one of three unenrolled candidates vying for the gubernatorial office. Running as a candidate from the United Independent Party, a political party he launched in January 2013, Falchuk hopes to represent the group’s values of equality, civil rights and efficient use of taxpayer money. Raised in Newton, where he now lives with his wife and three kids, Falchuk wants his campaign to engage voters and inspire a movement of independent candidates to run for office. With his campaign slogan focused on “smart, brave reform,” Falchuk says his ability to take a strong stance on positions and offer answers sets him apart from his opponents. Sitting in his office on Tremont Street, Falchuk spoke to the Daily Free Press about campaign goals, flaws with the two-party system and his passion for political engagement. FG: You grew up in Massachusetts, and you ended up back here, running for governor. What brought you back to the Commonwealth and inspired you to get into politics? That’s what got me motivated. I look and I say ‘I am a voter, and what am I supposed to do about this?’ I can sit back and say it stinks and not participate, but at a certain point, you’re like, ‘Well, we all have a responsibility to do something about the things that are going on in our country.’ And there so many layers of which this stuff gets really really bad. And I got kids. In each generation, we have a responsibility to make sure things are better than they were before, not worse. And unfortunately, the world that we are in right now is one that is not as good as it once was. It’s better in a lot of ways, but there are a lot of ways in which it’s heading in a bad direction, and we’ve got a responsibility to change it. FG: At what point did you realize you didn’t associate with the left or right and decide a third party would be best for you? I’m a person who says I believe everyone is equal, so maybe I belong in one party because of that. Everyone’s civil rights have to be protected, so maybe I belong in one party. And I think the government’s got to spend taxpayer money wisely, so now maybe I’m in a different party…so what do I do?…So I said ‘Why can’t we create a new party? A structure, a framework, to get lots of new independent candidates on the ballot? Why can’t we do that?’ And you look on it in retrospect, and you say it’s really obvious that someone should do that, but at the time, it’s this new idea…it’s interesting…a party for people who aren’t in a party…because the independent voter is the majority of voters, and the independent voter has a diverse set of views. FG: Did you know you wanted to run for office when you first launched the United Independent Party? EF: Yeah because the only way you make real political change is by having political influence, but real, meaningful change, and that can only happen by people running for office. And it has to be about much more than just one person. Yes, I’m running for governor. Yes, I funded this party. Yes, we are working every day to win the election, and I can see how we will do that. But it has to be about more than me. That’s why we have this party structure…Personal goal: minimum, we want to make sure we become an official party, which really matters. All you’ve got to do is get 3 percent of the vote in a statewide election to become an official party, which is a huge deal because there are different rules for ballot access. There are different rules for funding…My personal goals: 3 percent and winning. And then it becomes about how we build for the future because my next goal is 2016. How do we start to fill that legislature with people who think about these things in the way that I’m talking about? FG: When you go to your website, the slogan says “smart, brave reform.” What do those words mean to you? And why are the actions and goals of the Democratic and Republican candidates not smart and brave? FG: Now, one of your opponents who you’ve mentioned, Coakley, could come back and respond to that statement by saying she is running for the entire Commonwealth and she’s just trying to find a common ground. Would you say that’s not the way you should run? EF: I would say that you’re interviewing for a job. And this is a big job with important responsibilities. And as a businessperson, I’m interviewing you, and let’s say I want you to be our head of public relations…do you believe we should be doing direct mail campaigns to reporters in order to get stories written about this company? And if you say, well…I’m willing to look at what other companies have done with direct mail solicitations, and I’ve said before I’m against them, but I do understand the need…now, I’m sitting here looking at you, and I’m saying ‘Dude, I’m asking you.’ In any situation in your life, would you give an answer like that to somebody? And that’s the problem – in politics, our standards have become so low that we can hear that and you can just come up with something [on our own]. FG: What are the biggest flaws today in the two party system? EF: The parties themselves are not representative of people. The parties themselves are not interested in changing, other than what it takes to keep a grip onto their power and authority, so that’s why the issues they end up dealing with change with the political winds…You cannot change those parties from within. It can only happen by someone from the outside disrupting the system. FG: When it comes to the ballot question about repealing the state casino law, where do you fall on that? EF: I’m voting against that, and against the repeal means it gets to stay. The legislature voted in 2011 to create a framework, which allowed the cities and towns to decide if they wanted casinos in their cities and towns, and then the cities and towns voted. And there were a lot of hard-fought battles in the cities and towns on these issues, and we had two places that said they want casinos. We had a number of places that said they did not. So planning has been preceding on that basis, and now we’re trying to upend that on this ballot initiative…This is no way to do business, and this is no way to operate a democracy. And it’s everything that’s wrong. We had the debate, we discussed this, we voted and now, we have to be able to move on. And that’s it. FG: Where do you stand on gun laws? Are there additions you want to make to make the Commonwealth safer? EF: If the problem we’re trying to deal with is gun violence, which is why you see all the movement on these gun laws…Here’s the thing. You’ve got a Second Amendment right to own a gun in this country. The government can also regulate it…We live in a country where there are guns and there are a lot of them, and there are a lot of people who own guns. And the overwhelming majority of those law-abiding gun owners aren’t using those guns for any bad purpose…the problem that we have is the people who are using these weapons illegally…[But] you could make every single person in Massachusetts have a lock on their lawfully-owned gun, and you’re not going to stop the illegal gun use and crime. So what is the solution to the problem? Look, there are always things we could do with gun laws, but at the end of the day, we have to get to the root causes of why violence happens and address it. We need gun laws, and I’m not in any way saying we should reduce or limit them…but let’s be real. Let’s get to the underlying causes. FG: You and your running mate, Angus Jennings, created the Falchuk-Jennings Thriving Communities Action Plan. Can you just explain a little about what it will do and how it will fix the housing market? EF: What is inherent in that plan is that every city and town looks at the concept of planning and says ‘It’s in my financial best interest to see lots of new homes built in my community.’…You lower people’s costs of living and you get more young people living here with more money in their pockets, they start businesses, they do all kinds of things and there’s new economic activity. 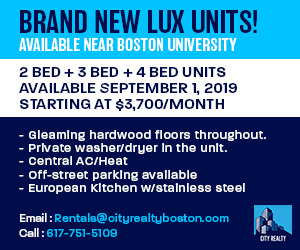 We have no housing production plan in Massachusetts. So that thriving plan is all about jobs and economic growth…When I say “smart, brave,” what I mean is that we’re laying it out there. FG: Education is a big issue across the board in the gubernatorial race. You talk about your Action to Honors Plan on your website. What makes that different than what other candidates are proposing? EF: What we propose here is that I know there’s not enough money going to the schools…we lose the ability to actually have a holistic sense of what it means to educate a kid. I think kids should graduate from school with critical thinking skills and creativity and determination and grit. We have to make sure the money’s there for starters, so the action part is filling that gap right now…this is the opportunity. This is our future we’re investing in with kids…And then over the long term, say ‘What does it look like 20 years from now?’ And for me, good planning does that. So this is a time after all of us are out of office, so forget about the politics of it because it’s 20 years from now. And then you can work backwards and say how does it look? FG: What makes you the candidate to beat? EF: Most voters say they want independent leadership, so here’s the question: will they vote? They’ve got to vote. That’s the bottom line. People say ‘I want a viable independent candidate. I want someone who’s not fringe. I want someone who’s actually accomplished something. I want someone who believes, somebody who’s going to level with me on stuff.’ Well, I’m here. I’m laying it out for you. So, vote. If you vote, it’ll happen. If you don’t vote, you’re going to be stuck with the same problems again. Author: Felicia GansFormer Editor-in-Chief. 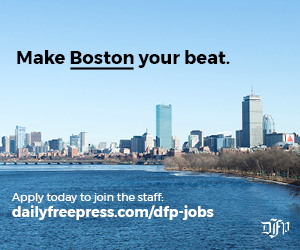 I'm addicted to The Daily Free Press, and I thrive on coffee, journalism, and jars of Nutella.